A bullet hell game about a hermit disrupting telecommunication system antennas. Destroy drones with the energy you accumulate on your Tin Foil Hat, collect 10 scraps to build faraday cages around each antenna and get 'em all offline! All art work was done pixel by pixel using a text-editor, mapping each character to a color. 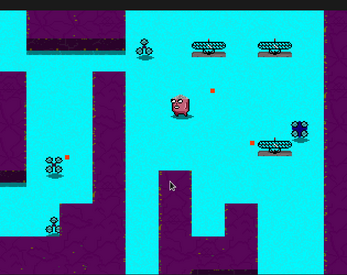 Some tile details and animations are generated randomly. The look and feel and play experience where inspired by games like Nuclear Throne and Battle City, with arcade elements. Special attack and defence, like "dash" and "blast all enemies"
This is really fun! I like the concept and the art. The map moves a lot when moving the cursor which is a little disorientating. Would be curious to see how it feels with that movement toned down a bit.